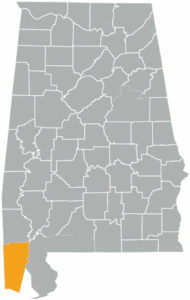 Satsuma is a relatively small city located in the state of Alabama. With a population of 6,193 people and just one neighborhood, Satsuma is the 98th largest community in Alabama. Current public safety building was formerly a residential dwelling. After several additions it has become antiquated and in desperate need of replacement. The public safety building houses Police and Fire Safety. The original building was in a state of disrepair and had become a safety hazard. The new 9,600 square foot building will be located on 7 acres, and will better serve the community and expand the overall quality of the City’s first response capabilities. Improvements that will be added to new facility will include an improved secure area for prisoner housing, decontamination area for personnel and equipment as well as an updated dispatch room. The City of Satsuma is located near the City of Mobile and has experienced significant growth in the last few years due to strategic economic development. Satsuma is known as a gateway to the Mobile Delta and Mobile River due to its proximity to creeks and waterways. In 2017, Mayor Tom Williams announced the city would be replacing their existing public safety building with a new state of the art facility housing the jail, police department and fire department. The 9,600 square foot building will be located on 7 acres, and will receive $2 million in funding from UB Community Development’s Community Facilities Lending Program. The overall poor physical condition of the existing facility coupled with safety issues led to the unanimous decision to replace the current facility. Several improvements will be added to the new facility, such as correcting the undersized dispatch doors that prevent the fire engines from pulling through the facility, a separate decontamination area for personnel and equipment, an improved secure area for prisoner housing, and an updated dispatch room. 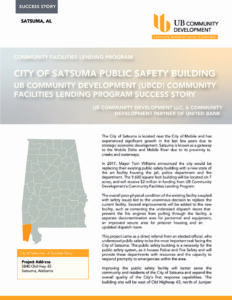 This project came as a direct referral from an elected official, who understood public safety to be the most important task facing the City of Satsuma. The public safety building is a necessity for the public safety system, as it houses Police and Fire Safety and will provide these departments with resources and the capacity to respond promptly to emergencies within the area.